"You came from Dust, to Dust you will return". All things other than the infinite Cycles within Cycles of Dust come to an end. Life was borne from Dust - the Dust comprised in the vast infinite Space named "The Universe". In that vast space everything is but a micro-microscopic speck of dust. Whatever elements evolve from the electromagnetic "Cosmodust" activity e.g. friction, collision, are forms of Life of one kind or other. This page is my last word on the net. I have said all there is to say. Please read on. 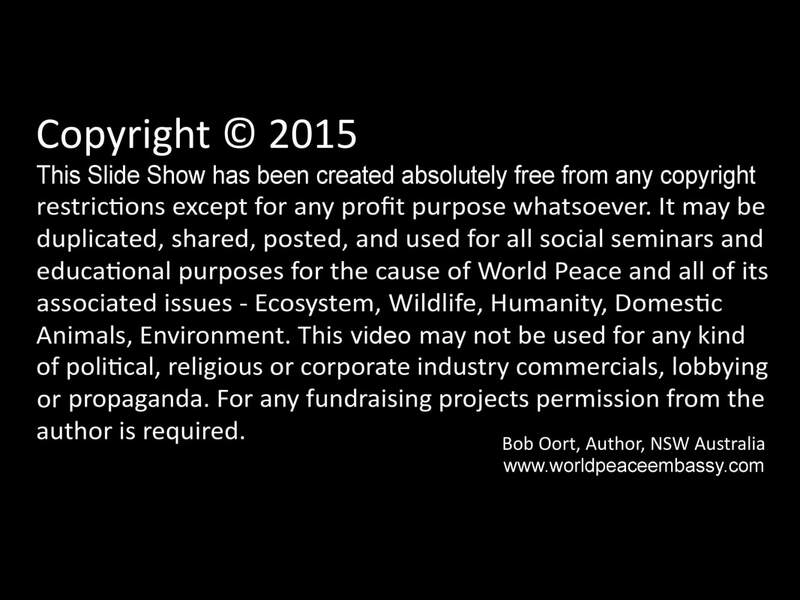 Click Play ⬇︎ to start the slide show, Pause to read extended text, Play to restart. Lloyd Pye's (1946-2013) science opposed views, derived from the Sumerian tablets, that humans were created by the Anunnaki to serve "their" Planet Earth industries as a slave civilization. Whichever way we look at things, a New Era for this civilization comes when it detaches itself from all historic species. Graham Hancock presentation on the war on Consciousness. 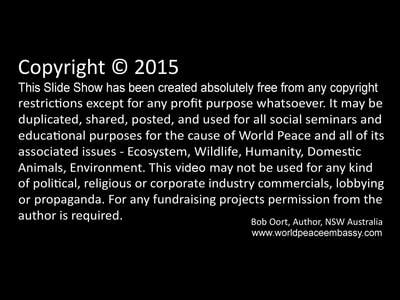 If you haven't done so as yet, scroll back to the slideshow top of the page, where I propose my non academic view of how Consciousness came about as part of an evolutionary process of Electromagnetic Frequencies activity in the Universe. Fact? Who knows? Food for thought. The manifestation of untouchable non existent images in the mind of the Homo Sapiens - Intelligent Man - ??? - has been an ongoing process since before any species of the kind was introduced to this most exploited and abused Life producing piece of dust in the Universe. Our (Man's) brain has been infused with concepts that have no bearing on anything to do with Life whatsoever. We are a manipulated slave species for something we have no hope of ever understanding. Whatever something that may be, it has wired us to create our own mental evolutionary capacity and our own fate - all pre-scribed as per and subject to a slavery and Earth exploitation for wars blueprint. We, humanity, are subject to an untouchable force beyond our capacity to control - it controls us, from outside Planet Earth and from within civilization on Planet Earth. A "loving God" does not enter the equation, "He" does not exist. Images painted by fantasies are reproduced in the brain of those to whom they are exposed and stored away to be retrieved any time a conversation or incident triggers the image to re-emerge visually in the mind. Mind images are physically untouchable, but to many people continually reminded of them, as through continuous indoctrination, they become representative of something that physically exists even though it can in no way be proven to exist. Religion is the oldest and longest prevailing political institution in the entire history of mankind and it goes back beyond the history of Planet Earth - the Universe is a graveyard full of Gods, every so called "leader" was a God, the Universe is a deadly war zone where Gods fight Gods for mere control over a Universe they could never control and still can't and never will. But the slaves died by the billions and continue to die by the billions, for Gods that are none more but self appointed ego possessed war lords. A "loving God" does not exist. And so, my journey ends here - my Facebook journey that is, my personal journey started in 1940. My Facebook journey started in 2010 as a novice wandering around in a world full of strangers, that is, people I did not know, for I don't actually see people as strangers, they represent cohabitants of the temporary place where I live namely Planet Earth, and they are co-travelers on the same journey granted by a temporary visa - an unwritten, unspoken visa, but a visa nonetheless. I am tired of seeing the obsession with self portrait profile pictures on Facebook. The blunt refusal to change a selfie for a WORLD PEACE profile picture in order to stand united, in solidarity for Change, World Peace and Justice for all shows up how pathetic the majority of this egocentric "me" and "mine" society really is. until they come to the end of this most futile, unforgiving journey and are fed up with the parrot fashion institutionalized paraphrasing like "things are changing" and "people are waking up". My mental capacity has its finite limits. Today 2 months into my 78th year on this Earth, 8 of which, 2010-2018, were wasted on Facebook, I have duly had enough. I wrote for Peace, sanity and Justice for eight years, but general public apathy is stacked up against those who take the initiative to undertake any kind of Peace project. People are dying, animals are dying, by the most horrific, barbaric means, the soil is raped and depleted at an unprecedented rate, the environment is dying together with everything that depends on it, but you, the user of everything for sale in this corporate/religious world lives the illusions of egocentric worthlessness, your head in the clouds, aside from you, there lives or dies no one and nothing else on this Planet. 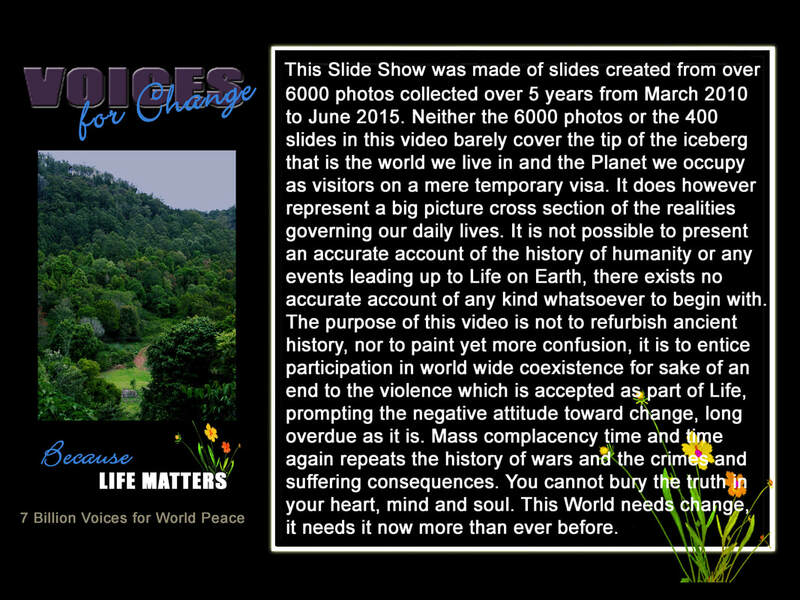 So what was a feasible project for for World Peace to begin with in 2010, ends up a war zone on Facebook, an individual with a mere handful of supporters against not only the establishment and its institutions but no less the very people who should be tired of wars, crime, corruption, destruction, injustice and the suffering of all living species, ecosystem included. Beyond the word cemetery your World is a dumping ground for used and obsolete war arsenal and dead people and animals. It's not my problem anymore, I did not create your wars, your religions, your politics and your sorry comfort zone consumer society lifestyle. I'm done. Your turn to take up the long overdue responsibility you owe this world for lack of care. It has all been said, too many times. With close to 8 billion people in this World and 2.13 billion Facebook accounts (at April 2018) choking the net with an infinity of fictional fantasies and illusions, Facebook "apps", band aid petitions, so called "warrior groups" among a host of thousands of groups set up by FB to keep people going around in vicious cycles of the same old millenniums old saga from religious-political institutionalization to corporate-industrial institutionalization. If people are happy living the same old forever ongoing treadmill then there is nothing anyone can do. There is nothing that has not been said and written the past 10,000 years, not millions, but billions have died in the preposterous wars across the entire human history, the legacy of which has become all too visible thanks to the technologies that are killing the life out of Life under the guise of "progress" and the "prosperity of mankind" - prosperity built on a Planet dying from the absolute egocentric, fantasizing, off this Planet lunacy that is the overall human race.....??? Go find yourself some reasons for it all among the billions cycling Facebook alone, all have explanations for one thing or other, but be happy folks, carry on living the illusion, things will get better soon, for those still breathing that is, never mind all who suffer and all which suffers the consequences of this material and psychological garbage consuming society. Party on folks, as they say, you only live once..... lucky you, millions of other beings born into this World never get to live a life at all unless you could call the horrors and trauma they are subjected to "Life". April 15, 2018 was the day that this group was going to be buried. To delete a group from Facebook, its administrator has to delete all members until the administrator is the only person left. The administrator then deletes himself/herself, then the group will be deleted. After 3 hours of manually deleting all 390 members one by one, administrator deletes himself and thus, the group will no longer exist. Not so. Facebook insists the group has 8 members. So administrator goes back to the members page only to find there are no more members except one - the administrator. Administrator goes back to the group page and finds that the robot persists in saying this group has 8 members. So with all members deleted except 8 ghosts which the robot insists are people still in the group and therefor the group can't be deleted, administrator is now left with two choices: Stay, or leave the group and the administrator job will, says the robot, be given to another member. So mr entrepreneur creates a product, anything, whether people need it is not relevant. He then contracts a few creative specimen eager to get hold of some money who design the product labels and the advertising campaign. Mr entrepreneur has assets, but no money, he does everything on borrowed money e.g. promissory notes. He then sets up the production plant, preferably in an "underdeveloped country" and hires the necessary workers on low or below breadline wages to manufacture the product. When business fails, one mr entrepreneur declares himself bankrupt, another jumps out the window of his 50th floor boardroom, either way, the workers are back on the street again, but they should have known better and do something more constructive than wait for some entrepreneur, or the government, to give them a job. If you want to work for the dysfunctional establishment, don't expect anything other than one disillusion after another. You really need to start being more creative in becoming independent from the system that screws you time and time again. For a start you could think about all the trash you buy that you don't need. Throw out that mind control machine in your living room for starters, you'll find yourself a new person, a human being instead of a flesh and blood robot, the moment you have defeated the withdrawal symptoms, which could take up to 48 hours. Then, take it another step one at a time, get rid of your alcohol needs, it's the biggest killer on Earth, the same foul stuff that bought out the natives of the Americas, Africa, India, Australia, Hawaii and New Zealand for a few people's common wealth. After that, take a displaced soul in your care, human or animal, whichever works best for you. Then, start feeding yourself and your family real food, produced by trustworthy local organic growers, stop devouring animals - they have a life and it's not yours to cut up and shove onto your dinner table, and, vegetarian food hurts no one, on the contrary, only the livestock industry hurts everything, environment included, it has to go if you want to see a better world. So, this group died, all members have been deleted except for those 8 Facebook ghosts the robot has left to haunt this house. So we'll stick around for a while and contemplate what to do about the WORLD PEACE EMBASSY over the coming weeks or so. I'll hereby replace the "Deleted Group" name by its original title, robot's behavior pending, and new members will be approved while the pros and cons are thoroughly being weighed against each other. Meanwhile, feel free to share anything you might find among the haunted rooms and cobwebs in what is now a World Peace Museum. This Web Site remains open for visits 24/7, browse it at your leisure while you're thinking about making some changes in your life that could potentially change life for the better for all concerned. 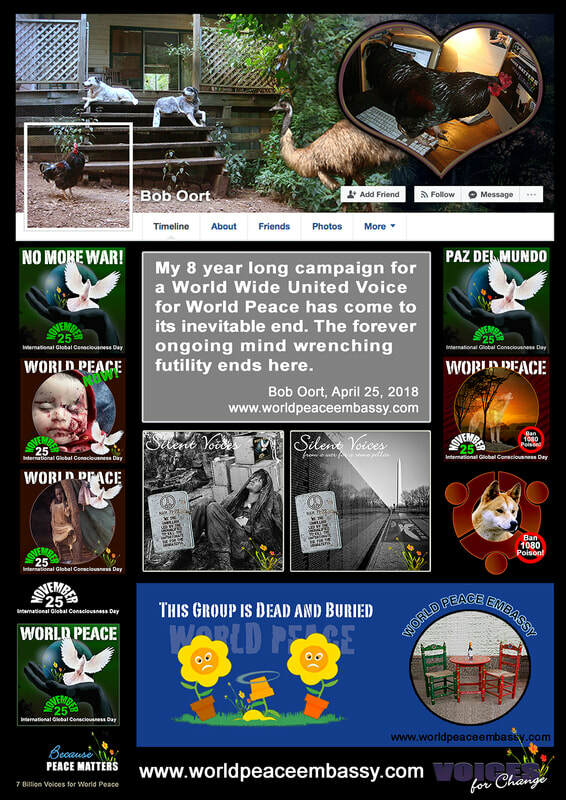 After all said and done, the Facebook WORLD PEACE EMBASSY group was deleted late 2018 as part of deactivating my Facebook account by December 18, 2018. 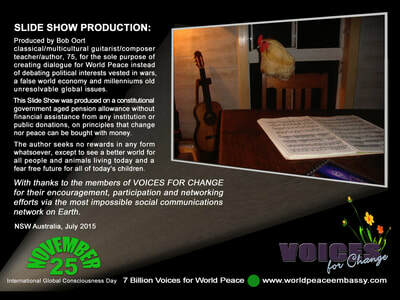 VOICES FOR CHANGE remains on Facebook while it still has members/administrators. IT'S TIME to face the truth about Facebook. Facebook, Google, Twitter, etc. etc. etc. etc. belong to the species that control and enslave this world's human population. The internet does not serve the people, it exploits and abuses people. The internet does not educate people, it sells confusion, lies, and preys on the vulnerability of those who are easily led by sensationalism, misrepresentation and illusions. The internet is a mirrored reflection of the ghettos of daily life on Planet Earth, no place barred, a mirror in which every individual can see him/herself reflected - like seeing oneself in the window of a signature fashion or commoddities shop when about to buy slave (including children) labor produced items from factories in so called "underdeveloped countries" that have been purposely thrown into poverty by "the System". You're on Facebook, for whatever reason, but mostly because you're dragged along by the masses that are in turn driven by "market forces" creating "goods and services" no one needs, though "market forces" say otherwise, whether goods/services are needed or not is of no relevance to the racketeers sucking the Life out of life. Without continuously creating and selling new products the slavery economy falls apart. We, the masses at the short end of the system should by now know that we're not only being deceived by forces wielding power over anyone and anything they choose, but as a civilization on the whole we are being "governed" by entities that possess more power than imaginable by most people and are using it to keep this society functioning in its conditioned slavery status. We have been set up to not know the truth and we are monitored to remain subordinate to the entities that created us for their own purposes whatever they may be, but whatever those purposes, they are not to serve the human race or any human individual, that, should be abundantly clear if not from historic retrospect, this very moment in time on this Planet bears testimony to the horrific ecocide/genocide, the wars, people pitted against one and other, animal abuse, ecosystem devastation, taking place daily, indefinitely. Most people feel that there is something drastically wrong with the way this society works but see no way out of the system for a number of reasons, fear most of all. Stepping out of the system however, begins by disengageing one's habitual attachments to anything that controls one's thinking and therefor one's behavior and one's actions. People becoming conscious and independent is the greatest fear of those trying to hang on to their fake wealth and power. point - Facebook is an evil domain, like all evil, handing people a few sweets while taking back what it wants by the truckloads. People are wittingly yet unwittingly deceived by the criminal system that owns and runs Life on Earth for its own purposes, nothing else. Facebook, all other so called free public media included, is the tool that has people chained to multimedia gadgets and devices turning them into robotic zombies that follow every command sent into their brain, remote or otherwise. Facebook is rounding up people like cowboys round up cattle, both equally as ruthless as one and other, Life is not relevant, the cause for a material star wars robots existence is all that matters to those that run this civilization. To my few real Facebook friends I'd like to say thank you for your friendship and your support for my 8 year long November 25 International Global Concsiousness Day, World Peace (and sanity) campaign. I sincerely treasure the many chats I've had over the years, but I am detaching myself from this evil domain some time this month, December 2018. I hope that all who are still capable of doing their own thinking will follow suit and break the chains that keep you fixed on Facebook and mind control devices. Facebook isn't about Life, it is about keeping you occupied with corporate commercial trash entertainment while having you believe you're in good hands and you're doing something good for this world. Nothing is further from the truth. Facebook feeds off the division it creates among its users, its user friendly facade is fake, most people have no idea of how it works, what its agendas are and how they are being used. Stop feeding this mechanical algorithm machine and its criminal operators, their data bases and bank accounts. Stop wasting your time and your life, take yourself out of this devil's domain, and start living YOUR life instead of a life fed to you by some remote dictatorship that lives both right here and elsewhere. Facebook is a cage for the vulnerable it constantly targets. You can only live so long in this evil domain, or ignore the messages and wither away until you're clinically or mentally dead. Just a short while ago I noticed the following in the VOICES FOR CHANGE group I administered since 2010 as the means to network November 25 International Global Consciousness Day, copied to paste here since only members can read posts in that group. May this help all those FB trusting people to give being part of this evil domain and thereby promoting its agendas some 2nd thought. After deactivating my Facebook account on December 18/2018, I set out on the road to self recovery i.e. debriefing my Facebook remote mind controlled addiction to this crime operated and riddled devil's domain - after warning my FB friends for at least 5 years of my observations of FB sucking in everything that floats on the net in its pursuit to monopolize the entire world of vulnerable people. So why am I still here, or rather, why am I back again? 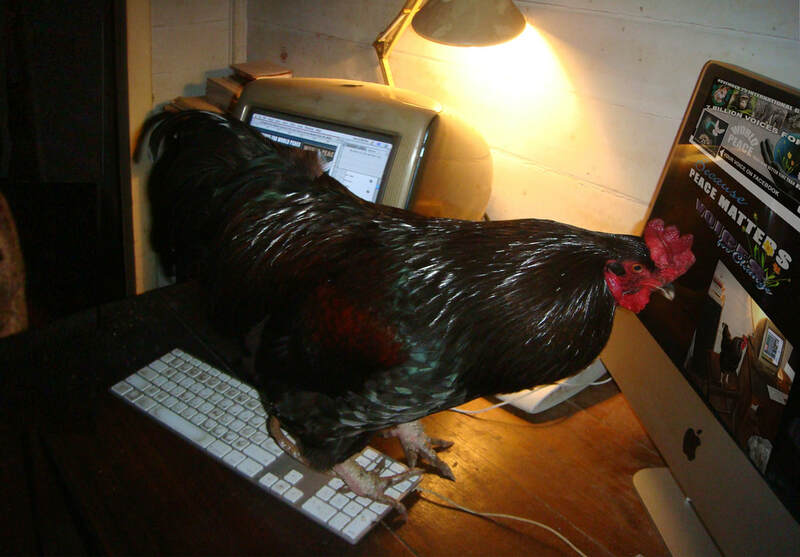 Here's why: Setting up my new computer my web site host required me to activate my site editor. 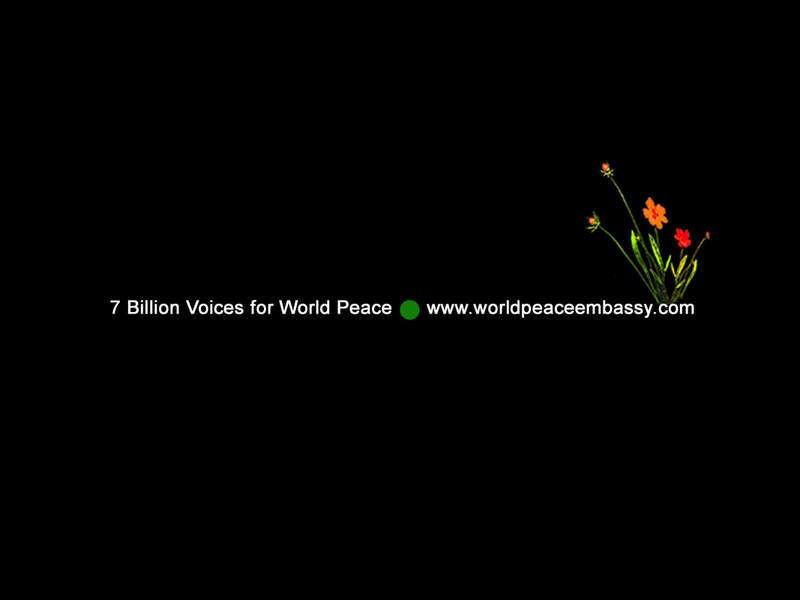 No sooner I did so, a message from Facebook said "Welcome back, your account has been re-activated when you activated your Weebly account" (Weebly is the web host/provider of the WORLD PEACE EMBASSY web site). Going to my Weebly editor dashboard I noticed that the Facebook option to choose yes or no was no longer there - figure out why. My web site host and Facebook are two different things, but I have seen how Facebook sucked Weebly into its vices since it gave me a choice to link shares to Facebook a few years back (can't remember when exactly), just as I saw how Facebook sucked in the Care2 petition site and many other sites one after another. What that means is that Facebook dictates the rules by which those sites/organizations operate e.g. "You're either with us, or you're not" - if you're not, well, good luck, nobody will ever hear of you or find you - at least not through almighty god FB with its close to 3 billion accounts. possible to have the technology governed by people who strictly adhere to total honesty and transparency for the well being of Life On Earth - but as things are, the reality is that everything on the net, as in daily life off the net, is ruled and governed by an entire dynastic crime institution which, as I have stated many times here and in my web site, writes the laws for its enslaved workforce. Anyhow, all endeavors by individuals and organizations doing things to make this world a better place could be said to be nothing more but a joke, people aren't ready for a world without crime and violence, this civilization is devided, as it has been set up to be from day one. I'll de-activate my Facebook account again on January 31st, feel free to comment on this post but after January 31st I will no longer respond whether Facebook keeps my account activated or not. And I repeat, the world will be a better place without Facebook and the like. 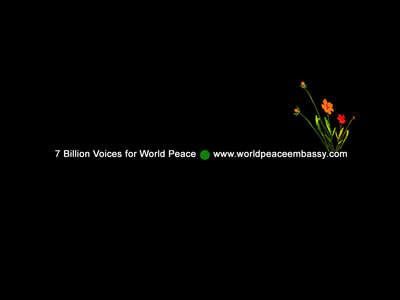 Meanwhile, the WORLD PEACE EMBASSY web site and my Youtube channel will remain active for as long as I can help it.